BALTIMORE, MD – The Maryland Department of General Services (DGS) Capital Grants Division and Facilities, Operations and Maintenance (FOM), in collaboration with the B&O Railroad Museum, today announced the opening of a new, temporary exhibit of paintings and photographs, entitled “Best in Service.” The exhibit, not previously publicly displayed, is from the B&O archives and will be available to the public on displayed in the lobby of the 301 W. Preston Street, Baltimore. The exhibit is a part of the department’s community outreach efforts and is in celebration of Black History Month. The exhibit honors the service and contributions of African Americans to the B&O Railroad. Thurgood Marshall, a Baltimore native and the first African American to serve on the U. S. Supreme Court, worked as a waiter and porter on board B&O dining cars while earning a college degree at Lincoln University in Chester County, Pennsylvania. 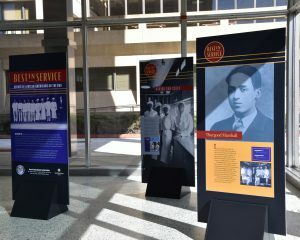 His life and service are highlighted in the exhibit. The lives and service of three other prominent African American B&O employees are also highlighted – Fearless M. Williams, Charles Wright and Maggie Hudson. The exhibit is free to the public and is open from Friday, February 8, 2019 through Friday, March 1, 2019. About DGS: The Department of General Services is responsible for essential services and programs administered on behalf of the state, including procuring goods and services; designing, building, leasing, managing and maintaining facilities; leading energy conservation efforts; and providing essential services such as fuel management, disposition of surplus property and records management. The Department of General Services Maryland Capitol Police maintains safety and security at state buildings. For more information on human trafficking in Maryland click here.